Since I've stopped playing World of Warcraft, I've stopped updating this section. This section is effectively dead. However, you can still download the UI mods should you still be interested in them. Well, I've been busy. Sorta. So, here's some status on what I'm working on. Still porting it to C++. It loads .torrents successfully, but the majority of the protocol implementation needs to be done differently since C++ XPCOM allows a multithreaded approach. I've made some graphical fixes which will be released as 0.7.5 shortly. My planned changes for version 1.0 currently crash Firefox. No, really. I've stopped playing it. My user interface mods are, essentially, dead. Originally from a thread on the official forums that has since been pruned, this is a list of the lore behind the various World of Warcraft realm names as of some time in early 2005. Aggramar - Aggramar the Avenger: Vanir Titan of the Pantheon. Once Sargeras' lieutenant, Aggramar took over Sargeras' postition when his superior changes sides. Aggramar is now in charge of combatting the Burning Legion and eliminating demonic taint. Patch 1.8 only really broke SimpleInventory because they moved part of the core UI into a load-on-demand addon. But I've got updated versions with the proper version tag. Patch 1.8 has been released. Quite honestly, I'm surprised it's been this soon. It doesn't exist. It never has. Blizzard has released a Silithus preview (complete with a map), and announced that the Offspring will play at BlizzCon. To be completely honest, I'm rather underwhelmed at this point. I'm just not that excited about any new content in WoW. First, Caydiem announces the Druid 1.8 Talent Preview. Most interesting change (for me, at least) is the addition of the Moonkin form in the Balance tree. Next up, Eyonix warns of email scams. Be smart, people. Blizzard doesn't need to know your account information - they already know it. The only time you'll need to enter your account information is through the official World of Warcraft site, and only via an encrypted page. If you don't see the Yellow Lock meaning it's secured, DO NOT GIVE UP YOUR PASSWORD. And make sure you're really on www.worldofwarcraft.com! Eyonix has been on a roll recently, posting about many 1.8 changes. First off, Upcoming Instant Melee Attack Change, which changes damage calculations to use a fixed value for weapon speed. Effectively, this will nerf "slow" daggers. And, as an added bonus, Eyonix explains how +Spell Hit gear works. Since the Blizzard forums prunes posts after a given amount of time, the full text of the comments are duplicated below. I've updated the various addons I have for the 1.7 patch. 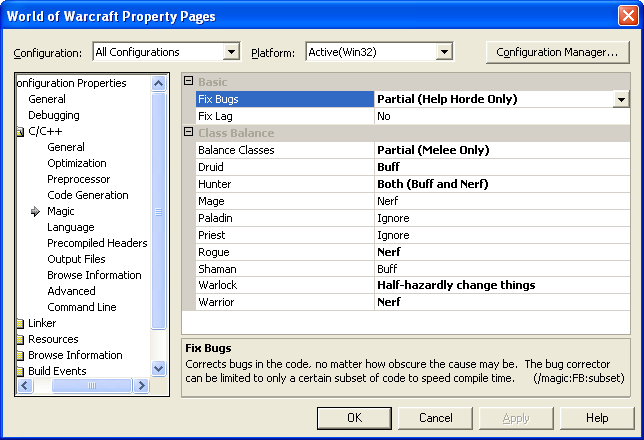 Note that all of the addons have been altered, and in some cases, the old versions do NOT work with 1.7. This is simply a compatibility update to make it compatible with 1.7. This should (hopefully) fix a bug where flight music would be "overridden" by zone music, which was not intended.